3-5 About 160 people have shown up for the Aussie Nationals with 26 in my division (Radial Grand Master). It rained all day and blew about 15. Weeds are unusual here and were a problem for everyone. In both races I got away cleanly in this my second radial competition (the first was 20 years ago at RCYC and was a drifter). Upwind speed was good but downwind was really bad. I'm trying the Luke Lawrence 90 degree turns and it just is not working for me. 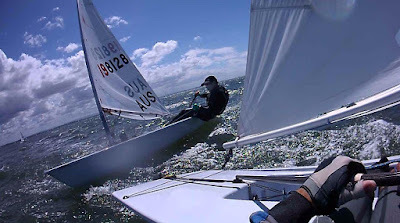 So I was talking with my friend, Brett Beyer, who sails in a younger division, has won about 6 Worlds, and is also the Olympic coach for Norway, Korea, and Singapore. Great guy and great sailor. His specialty is downwind and he's only doing 20 degree turns, so I'm going to practice with him to improve my downwind speed. I had a 3 and a 3 (lost 2 on the second beat of race 2 because I missed a rightie at the top of the second beat). There's a lot of speed in this fleet and I feel fortunate to be in second place. 3-6 There was a strong wind warning and the weatherman did not disappoint. The breeze started at 15 mph and picked up, with recorded gusts over 30. We had 3 races back to back. I am soooo glad to be using an old sail! 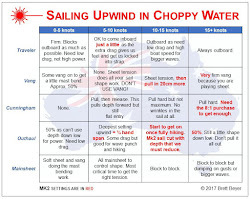 My starts and upwind speed were good and my downwind speed was better. My positions after the first windward-leeward were 1, 1, and 3. I tended to lose on shifts on the second beats that were left favored, with a parade of boats coming in from the right in the second race. The runs and reaches were screamers, with the first race being the most memorable. At the bottom of the outside run on the trapezoid course, the first 2 boats could not jibe onto the bottom reach because they were in a very hard gust and on a big wave. So, they had to keep going and sailed right off the course - something I've never seen before. Third and fourth (me) had jibed early and took the lead, but at the bottom of the reach the end of my boom touched a wave and I spun out and then had trouble bearing off again and not flipping. It cost me one position. People did everything to survive rounding the bottom mark and only then pulled in all of the controls. Definitely wet and wild. The seamanship of these sailors is remarkable with hardly any capsizes. 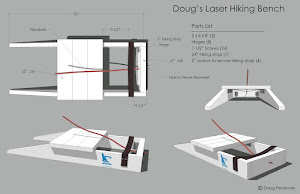 Lasers sometimes have interesting breakdowns. In a strong gust going downwind, one of 4 things sometimes happens. If not perfectly balanced, you tip to leeward or windward. If perfectly balanced, you fly or your break your mast. In the second race on a reach, Mark Bethwaite's mast broke at the deck which tells me that he was balanced and something had to give. Sure glad it was this week and not next. So, I've slipped to third place behind a Kiwi (the heavy-air specialists) and a fellow from Sydney. Two more races to go with a forecast for lighter conditions. 3-7 The conditions were similar to yesterday but there was no rain and it was not as windy - about 15-18, and certainly not the light conditions that were forecast. In the first race, I got away cleanly and led at the first mark by 25 seconds but was reeled in by the bottom of the run by Adam French (AUS). We were even on the next beat and then he took off on the reach and run, so downwind continues to be problematic in a breeze. Finished second. In the final race I started between Adam and leader Mike Keetom (NZL) without a good lane, but was able to protect my lane and force Mike to tack. About 300 meters from the mark ducked them before tacking onto the port tack layline. With the current going right to left, ended up overshooting the mark by about 50 meters and rounded 4th. On the run was able to stay with the leaders for the first time until I ran into the back of a wave and filled up with water. The leaders pulled ahead and I rounded in traffic, forcing me to tack away. When we converged they were 50 meters ahead. Did not feel fast for the rest of the race and struggled to finish 7th, my worst race. Final results: finished 3rd. The old sail I used probably did not make a difference, although it will be good to use my new sail for the Worlds that start on Sunday. 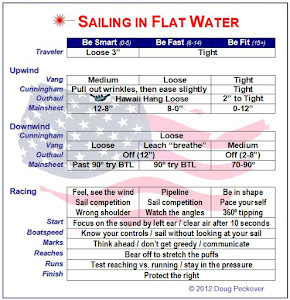 My starts and upwind speed were as good as anyone in the fleet in a breeze, so I'll be practicing my reaching and runs, along with my transitions at the mark roundings. While the Aussie Nationals had some really good sailors, there are more to come for the Worlds. Should be fun.